After five years of pilot programs, the Grandview Police Department now has body cameras for every officer in the department. GRANDVIEW, Mo. 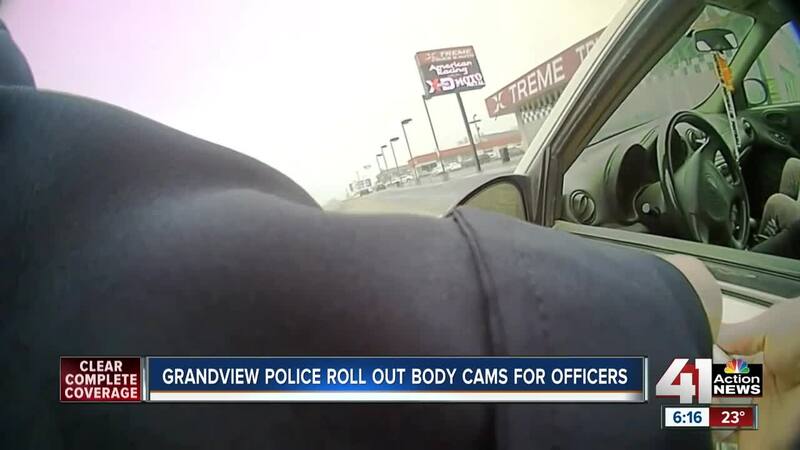 — After five years of pilot programs, the Grandview Police Department now has body cameras for every officer in the department. "It captures a perspective, not the perspective,” Grandview Police Sgt. Martin Studdard said. Body cameras have played a role nationwide in showing a different side to interactions between police and the public. Most police departments want the cameras, but the cost for storing video has been a hurdle for some. "All of those challenges take years. If you move too fast, you may regret your decision and find out you don’t have the infrastructure," Studdard said. The Grandview Police Department participated in body camera pilot programs for five years, trying to find the best vendor. This week, the department rolled out a permanent program for all officers. The cost to the city is about $90,000. "It takes muscle memory to remember to push the button,” Officer Michael Murphy said. Murphy was one of the first officers in the department to get a body camera. "Its really nice to see officers doing DUIs with them. The in-car camera is great and all, but if we are doing a sobriety test out here, it is nice to get the officer's perspective on how impaired the driver is,” Murphy said. The Kansas City Police Department has shown interest in body cameras, but months after the deadline to announce a vendor, KCPD said it is still in the process of choosing one. The Grandview Police Department, a much smaller agency, will store its video on a local server. The video will be stored for 90 days or more. Some footage may be saved separately for criminal cases. "The thing I love about the body camera video is, it is impartial, it just records. It doesn’t record every angle, it doesn’t get every perspective, but it's another tool to help us combat crime,” Studdard said. The department's ultimate goal is to synchronize dash cameras and body cameras to create more angles of an incident, Studdard said.